I have a deadline tomorrow afternoon, so coffee has been my primary fuel the last days. Strong , dark roasted (fair trade) coffee with hot milk. Simple and a yummy. But, even if coffee and writing belongs together, neither coffee and paper nor coffee and computer keybords goes well together. So, to get the writing a little more exciting I put my glass of coffee close to the keyboard, forgot about it and knocked it over and ruined the laptop keyboard earlier today. Fortunately – I realized afterwards – the coffee didn’t reach the notebook with notes for the paper, which – since the notes were not written in bulletproof ink – had been a real disaster. I guess I have to consider writing my study notes in Noodler’s bulletproof black even if I detest the nib creep and that it feels like it is flooding from the nib.Another bright thing is that I have begun to use my Sailor Sapporo again. I had forgotten what a great little pen for note taking, margin notes etc that it is. It is very precise and even if it is small it is very comfortable to write with. A review of Sailor Sapporo can be found here and if you check the review index you’ll find more reviews of the Sapporo. 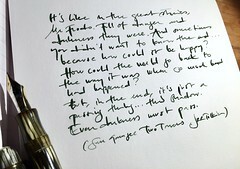 This entry was posted in fountain pens, inks, noodler's, pens, sailor and tagged coffee, fair trade, fountain pens, ink, noodler's, pens, reviews, sailor, writing. Bookmark the permalink.